The AFP First Coast Chapter offers a variety of scholarships to advance our profession and encourage chapter membership. Qualified individuals are encouraged to take advantage of the scholarship opportunities to attain or retain AFP membership, and increase their professionalism, knowledge and skills. If you would like to apply for a scholarship for 2019, please review the 2019 Scholarship Application Package. Send your completed Scholarship Application form and any additional required documentation to AFPJaxScholarships@gmail.com. If you have questions about scholarships, please contact Scholarship Chair Christy Smith or Scholarship Co-Chair Anthony Sutton. 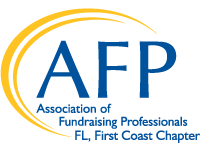 Individual AFP First Coast members are limited to one scholarship per calendar year. Only one scholarship award per category will be awarded per organization per year. Scholarship recipients are ineligible for one year after receiving their award EXCEPT when applying for a Renewing Member Scholarship. Recipients must serve on at least one local chapter committee. Please select at least one committee on your application form. Instructions: To be considered for an award, read the instructions carefully, submit the completed application and required documentation before the published deadline for the scholarship you are seeking, to: AFPJaxScholarships@gmail.com. Applications received after the deadline will not be considered. Your application will be reviewed and a decision made as soon as possible by the Chapter Review Committee. The amount of a scholarship award is dependent on the type of scholarship being received and fund availability as outlined in the individual scholarship descriptions within the Scholarship Application package. You will be notified by the Scholarship Committee Chairman of the Chapter Review Committee’s decision along with the amount awarded, if any. Payment for an award is conditional on the recipient fulfilling the obligation for which the award is made. If you have any questions, please contact Christy Smith or Anthony Sutton.